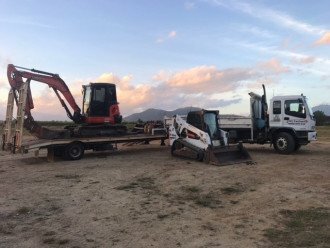 FNQ Earthworx < Earthmoving in Mobile Service < Cairns Local - Cairns Local Business Directory for Cairns, Bungalow, Palm Cove, Smithfield, Yorkeys Knob, Manunda, Portsmith, Stratford, Clifton Beach, Kewarra Beach and surrounds. When you’re after reliable wet hire earthmoving equipment at competitive prices, FNQ Earthworx is a smart choice. Cairns locals Shane and Nat Liversidge can help you in every stage of construction: from site levelling, and building works, to landscape preparation, and site cleanup. You’ll find equipment - and skilled operators for large and small jobs. If you’re after quality earthmoving equipment to get your job done quickly, and done well, we can help.